¿Quieres hablar inglés con soltura y confianza? Usar nuestros eBooks en tus clases de conversación por Skype con Online Language Academy es la mejor forma de aprender las habilidades necesarias para hablar con confianza y soltura sobre una gran variedad de temas interesantes y divertidos. E.g. The best way to improve your spoken in English is to study little and often. E.g. If you speak English on a regular basis, little by little you will speak with more fluency. 3. Go to bed early / Wake up early. E.g. Going to bed early is good for your health. Waking up early is one of the proven ways to be a productive person. E.g. I used to watch rubbish on TV and fall asleep on the sofa at night. E.g. 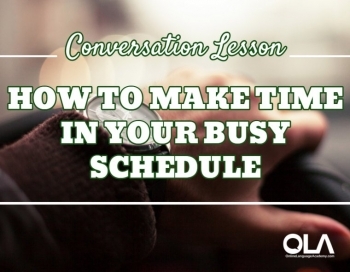 Planning your day and making a schedule can help you manage your time more efficiently. E.g. Learn to get help from people around you. E.g. If you run your own business it is vital to have good time management skills. 8. The early bird catches the worm. E.g. If you wake up early, you can get a lot of things done while everyone else is still sleeping. E.g. I like spending the weekends with my friends and visiting new places.